Many self-storage units do not come with locks. If that’s the case, you’ll need to get your own lock for your self storage unit. And the type of lock you get matters. My point is, it’s risky. By getting a bad lock, you are leaving your stuff’s safety up to chance. Play it safe! Padlocks – Padlocks have an upside-down-U metal bar that connects to a locking mechanism, which requires a key, a dial or a number combination. They are easy and cheap to buy, but, unfortunately, also easy and cheap to break — good bolt cutters can easily trim through the U-shaped bar. 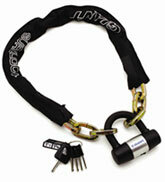 Disc Locks – Disc locks are like padlocks, except they have smaller bars, making them harder to cut with bolt cutters. Disc locks are the best locks for storage units. Chain Locks – These locks are long chains that connect at a locking mechanism. They are very easy to break, because they are long and thin. Though you can buy a sturdy disc lock, the best way to protect your stuff is to find a storage unit with a lock built in, preferably a cylinder lock, which is at the cutting edge of storage unit security. 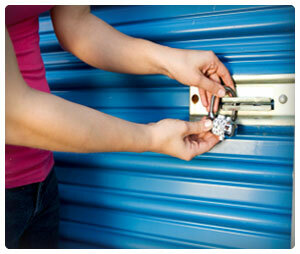 Ask your storage facility if they have cylinder locks before signing a lease. Also, a secure facility is even better than a good lock. If your facility has security or otherwise prevents people from getting near your storage space, you have little to worry about.